This week Shark Diver enjoyed some great coverage in the WSJ. 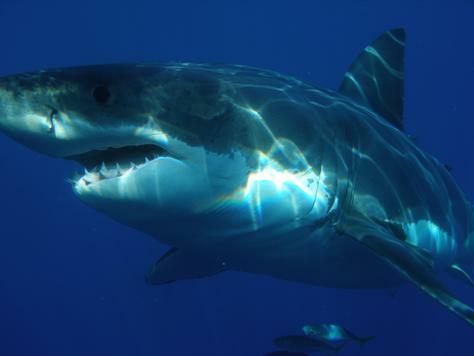 Thanks Sue S for the article, hopefully we'll see you this fall at Isla Guadalupe! Ask Marc Van Driessche about a recent vacation, and he will describe an adrenaline-charged shark-diving expedition off the Mexico coast with two menfriends. While he enjoyed his up-close encounter with Bruce, a great white shark the size of a bus, the family stayed home.Sue Shellenbarger discusses the rise of the "mancation," trips for men that go beyond traditional golf or fishing outings. What's in? Extreme sports, such as shark diving and machine-gun shooting. As much as he loves his wife and two young sons, Dr. Van Driessche, a Mukilteo, Wash., chiropractor, says some vacations are better taken with other guys. Pop culture has a term for it: the mancation. More men are getting away from family, work and household duties for trips with male friends who will watch your back, push you if you lose your nerve, and take care of themselves if they get seasick, Dr. Van Driessche says. They are departing from traditional male golf outings or fishing trips to engage in extreme sports, from off-road racing to machine-gun training. Also, more men are heading to destinations long regarded as more alluring to women—many with added "man caves" and other mancation-style amenities, such as poker tables and cigar bars. The trend shouldn't be confused with the bachelor-party stereotype of drunken bar crawls or partying at casinos, says James Hills, founder of mantripping.com, a two-year-old Web site that helps men plan their trips. Nor are they "singles trips" aimed at finding partners, he says. Instead, more men are using trips to deepen friendships, teach each other skills or push each other into adrenaline-charged activities that their families prefer to sit out. Others want to recapture the camaraderie of high school or college sports, or escape what they regard as an increasingly female-dominated world. A shift toward rising individualism in marriage is fueling the trend, by making separate getaways more acceptable to spouses.